[UPDATED] Philanthropist Tom Golisano has canceled his pledge of $25 million for a new theater for the Rochester Broadway Theatre League. Golisano announced the change in a press release this morning. "We are disappointed in losing Mr. Golisano as the naming rights giver," RBTL's CEO Arnie Rothschild said in an e-mail. "We will continue to work to make this important project a reality and change our downtown." The change took city officials by surprise. "It was a bolt out of the blue," spokesperson James Smith said. Just two weeks ago, the Warren administration announced a major development project by the river, that included a theater for RBTL, a smaller theater, a hotel, and residential units. 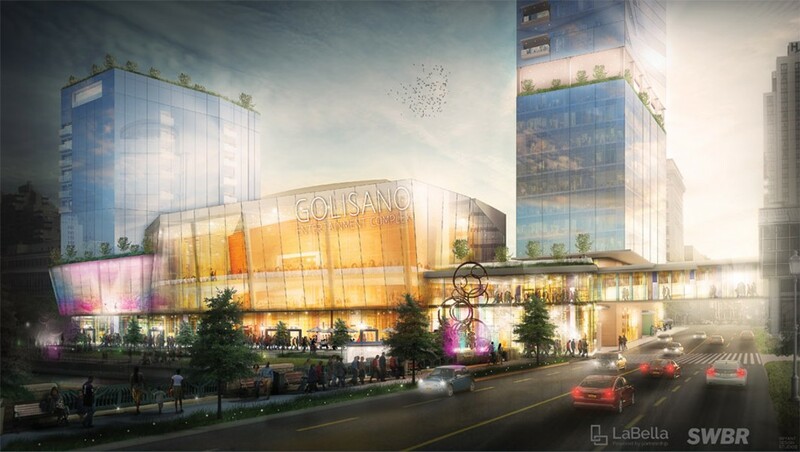 Renderings for the complex included a large sign reading "Golisano Entertainment Complex." The RBTL theater had been planned for Parcel 5, as part of a theater-apartment project, but its location there became in doubt after news that the FBI was investigation one of the Morgan development companies. Smith said this morning that city officials had talked with Golisano prior to the announcement. "He was on board," Smith said.